My little boy regularly points out things I would not have noticed on my own. As I mentioned before he regularly points out people wearing hats. He notices airplanes, balloons, birds, trees, flags and especially babies. He will start signing baby if he even glances a stroller or baby carier. He also notices and can express more complex thoughts. The other day we were playing at the little playground in our neighborhood which is close by the community swimming pool where a family was swimming and playing together. He stopped what he was doing to look over there and watch them several times. Then he popped up, toddled over to me and signed PLAY + WATER and pointed in the direction of the pool! "Hey! They are playing in the water over there!" I was able to respond and we talked about the swimming pool and how fun it is to play with water. A brief conversation initiated by my one year old that would not be possible without sign language. His signs have started evolving a little bit. When he first started signing PLAY and ALL DONE the signs pretty much looked the same, open hands moving up and down at the elbow with his wrists locked, and I would have to tell which it was based on context. Slowly he started to sign PLAY a little differently, with his ring and middle finger locked with his thumbs and pinky and index fingers slightly raised, a good approximation. Recently he has started twisting his hands at the wrist with both of these signs instead of keeping them locked and moving his whole arm. This is pretty amazing for such a young child. Wanting to communicate clearly and be understood is excellent motivation for him to work on his motor coordination and I am seeing improvements all the time! Recently I pulled out some of my pots and pans and wooden spoons for us to play with. My son was banging a spoon around in one of the pots and then he looked to me and signed COOK. 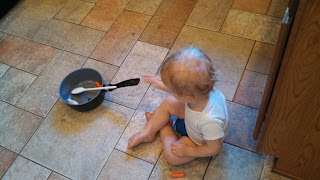 He was pretending to cook just like Mommy! If he did not have this sign I would has assumed he was just making noise. I probably would have starting clanging things around and talked about how fun it is to make noise taking the play in a completely different direction. Because he has this sign I knew he was playing pretend. We got some play food to put in the pan and talked about getting ready to eat and how the pan was getting hot. This has become one of his favorite games to play and I have seen him do it on his own sitting and stiring and signing COOK, EAT and HOT to himself. It makes me so happy that he is able to communicate things like this to me. I am just so glad I was able to recognize, encourage and help him extend his imaginative play. It is such an important way for young children to learn. Sleep has been a major challenge for us in the past. It's actually still an on going thing. My 14 month old still does not sleep through the night and naps can still be a challenge. I have more or less let my stress about it go, follow his lead and do my best to take it day by day. It's not always easy though. I still feel like I can't really read him well or depend on his ques. He might be acting exhausted but absolutely refuse a nap. He might seem bright and awake and happy as can be but pass out in the car or easily fall asleep if I try to offer a nap. He is mostly regular schedule wise, but I never know when the schedule is going to go completely out the window for a few days or weeks even. It's hard sometimes. Signing has helped some. When he starts looking tired and I start thinking about putting him to bed I start talking to him about it and signing SLEEP and BED saying things like "Are you getting SLEEPy? Is it time for BED? Maybe we should go upstairs and get ready for BED." I really think this helps him know what to expect and transition to sleep more easily. Sometimes when I start talking to him about it he will sign BED in response and then I know I'm on the right track and he's not going to fight it. Once or twice he has toddled over to the stairs and signed UPSTAIRS + BED all on his own without me bringing it up. That's the best! Recently my husband and I took our little boy out for lunch. When we were getting him out of his car seat in the parking lot and saying to him "Are you ready for lunch?" he got very excited and started signing EAT. This is so good for his little brain to be able to make those kind of associations and for us to be able to confirm them for him. We of course enthusiastically responded "Yes! It's time to go EAT some lunch!". It's fun for us as well to know that he really does understand a lot of what we say to him even if he doesn't have the exact sign or word, he understands whats going on. I think my son's favorite sign these days is SWITCH. I started signing this to him when we switch sides during breastfeeding. He now will stop during a feeding maybe after only a few moments and signs SWITCH. He might do it a couple times during a feeding. At first I was worried that maybe my supply was starting to drop and he was getting frustrated. But I have decided that what is really going on is that he is using his signing to exercise some control. It's part of growing up and the toddler years are infamous for tantrums and stubbornness for this very reason. They want and need to have some control over what happens to them. Signing empowers my son. It gives him some control over things. He can make decisions and communicate those decisions to me. This is wonderful and developmentally appropriate for his age. He obviously can't have everything he wants but he does get to make some decisions for himself and that is wonderful! Signing has become such a big part of how I interact with my little boy. I feel like I almost take it for granted. I honestly can not imagine how others parent a toddler without it! I can not even begin to imagine how our relationship and his behavior might be different if we didn't have this wonderful tool! It really is just so wonderful and I am I so glad that I decided to commit to teaching this to him. It is such a joy to be able to communicate with my baby.